IMPORTANT: Because I feel like the mod is getting a bit out of hand, a bit cluttered, and in a bit of a mess, over a few months max I will be removing FyreCraft from curse. 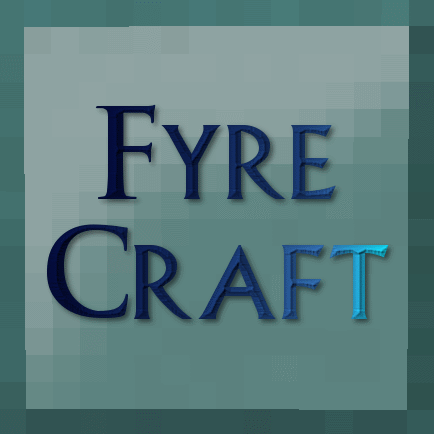 You may see some of FyreCraft's content re-uploaded in separate mods in the future, however. Introducing FyreCraft, a mod gradually helping Minecraft to grow more branches and expand outwards as it should. The mod requires Baubles, my enchantments mod, and any version of Forge newer than 2705. The GitHub is not updated regularly, due to me (FlashFyre) being the only developer :'( so please don't bother will pull requests and stuff like "add/change x". I recommend standing still for a good 30 seconds before moving around in the caves dimension - cascading world gen in y0 to y255 chunks full of stone and stuff generating is not pretty. If you want to report bugs or anything please let me know in Discord or in the comments here instead. Use the mod on servers AT YOUR OWN RISK! It has not been properly tested. If you experience crashes/bugs let me know! If you would like to include this in a modpack/record a video of the mod/stream gameplay of the mod/use it on a server, you may, but ONLY if you let me know what you are doing first! Adding this to my modpack of a little under 100 mods causes the game to crash when loading, so any idea what kind of mods could be conflicting with this one? Actually looking at the crash report, it seems that the dimension is causing the crash. Also, next time put the crash in pastebin or whatever. I don't really know if the cave dimensions is a good idea, I don't think it will bring a lot more to your mod. ExtraUtilities already adds a cave dimension, so it makes one useless duplication of it. Don't really get how adding a dimension wont bring more... and in what way will it make things more complicated? Eh don't take it bad, I just gave my opinion. It's your mod, you do whatever you want on it. I currently enjoy this mod, it's well made and balanced, and fits well vanilla. I just told you that unless you plan to make huge dimensions with a lot and exclusive content, really different from the overworld, I don't really see the use of it, because it would just look as a second overworld. I certainly do plan to make unique dimensions. The mod is currently in a alpha/beta stage. More will be added to the caves dimension, certainly. The biggest improvements will likely come when I learn how to code multiple biomes in one dimension. Infact to elaborate, the caves dimension currently spans y0 all the way to y255, and has 1 unique structure which will be improved. I also plan to add crystals which will have some use, biomes, more exclusive loot, etc etc. How i disable cavesDimension ? You can't because it's a key aspect of the mod. Goshdarn, I've been wanting a mod that adds Just An Underground Dimension for the longest time and this does it. Everything this mod adds feels very vanilla-esque and great! But that extra dimension is the icing on the cake.